The Mitchell & Ness x Just Don Drop Is Available Tomorrow | RESPECT. Mitchell & Ness is releasing three all-new shorts with designer, Don C! These new options will be a continuation of the Just Don collection. 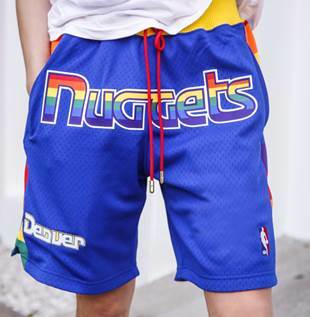 Launching today, a fan-favorite design, the Denver Nuggets shorts carries rainbow detailing across the front, as well as down the left and right side making it a bold staple. Also launching tomorrow – The Blazers authentic short, using the 99-2000 as the canvas, this off-the-court iteration carries the Blazer logo on the lower left and the red and white Blazer wordmark across the front. Each short comes complete with premium etched aglets and zipper pockets. Both shorts retail for $400 and will be available at MitchellAndNess.com and select retailers.